A few month back, my son designed a wallet for himself. 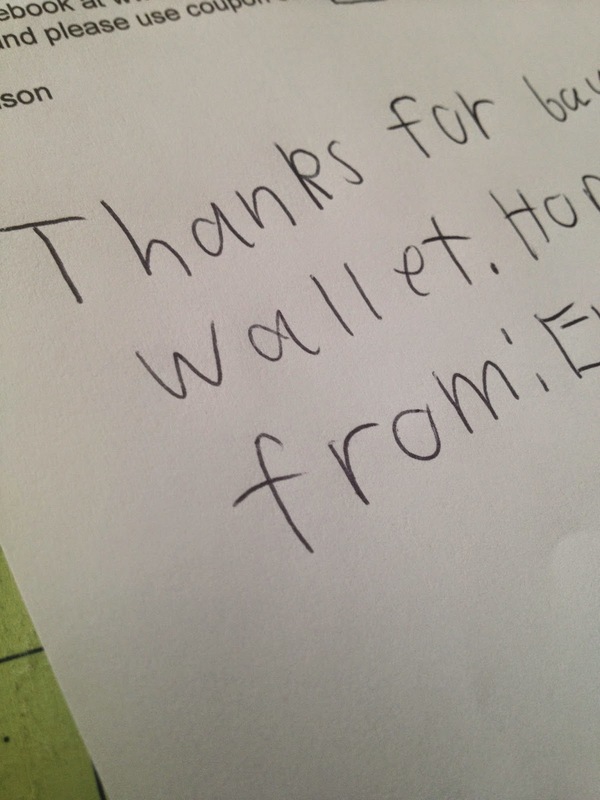 You can see his little drawing in the picture below, along with his completed wallet. Recently, he has been looking for some ways to earn extra money. I decided to create a job for him in the shop so that he could work for the money while at the same time learn a little bit about what I do and what it means to run an Etsy shop. First we did a little redesign on the wallet, improving some areas he wanted to see changed. Next he helped select some fabrics to put together, starting with boy wallets because, in his words, there just aren't enough things in my shop for boys. He's right. Smart kid. Then I had him take some pictures for me for Instagram. The kid loves computers. And probably knows more than I do about using them already. So I put him in charge of adding a picture at the end of our listings that explained the wallet and the donation he'd be making with the sale of each one. $5 from each wallet goes toward helping with flood relief in Malawi. He helped me add the listings to our Etsy shop, and diligently checked the site several times the first day to see if he had any views or customer questions or sales. Very professional. Very business-like. After the first day, he did indeed have his first sale! And so I showed him how to print the invoice, write a personal note to his customer, package the wallet and mail it off. This weekend, we planned out a few girl wallets and posted those as well. And he was excited to put his $5 in the offering box for Malawi at church today.